Continuing in our series on artists whose careers were enhanced through the work of Francis Quirk we look at Stanley Woodward who had a solo show at Lehigh's Alumni Gallery in May of 1964. Our research into Woodward's show was prompted by the print he signed and dedicated to Quirk that we found among the papers auctioned in 2016 in Maine. The print image is shown below. With Warm Regards August 1, 1965"
We assembled the biography below on Stanley Wingate Woodward from a variety of sources. But do read on further as we have quite a lot to show from this prolific artist. 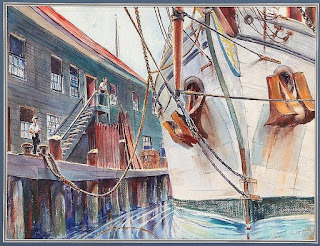 Rockport (Massachusetts) painter and illustrator, Stanley Wingate Woodward (1890-1970) was well recognized for his marines and seascapes. He was born in Malden Massachusetts. 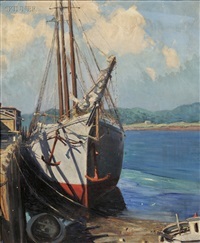 Woodward's education included studies at Eric Pape School Art, School of the Boston Museum Fine Arts, and the Pennsylvania Academy Fine Arts. He was the author of "Adventures in Marine Painting" (1948) and "Marine Painting in Oil and Watercolor" (1961). He was an illustrator for Collier's and Ford Times magazines. Woodward also was an instructor at the Woodward Outdoor Painting School (1935 -); Ringling Art School (1937-38); and the Laguna Beach School of Art & Design (1963). He served in the United States Amy in both World Wars. 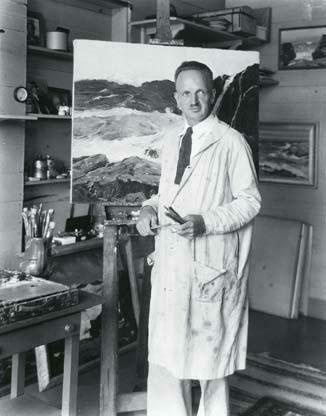 He held numerous exhibitions and one-man shows. 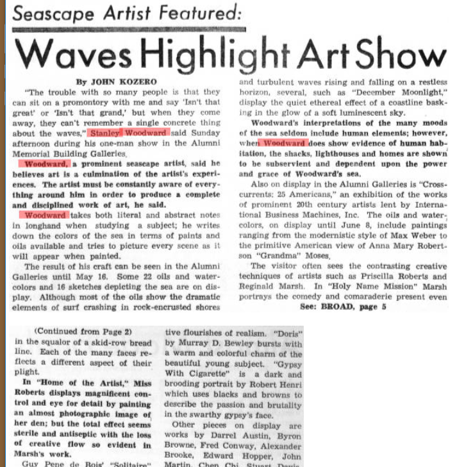 He was represented by Grand Central Art Galleries, NY and the Vose Gallery, Boston. 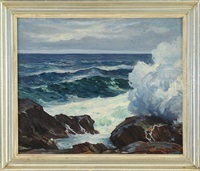 He was belonged to many organizations and won numerous prizes, National Academy, American Watercolor Society, Baltimore Watercolor Society, the Concord Art Association, Society of America Etchers, Boston Society of Water Color Painters, Salmagundi Club, Allied Artists American, Guild of Boston Artists, Audubon Artists New York, Rockport Art Association (prize oil 1959, Charles H. Cleaves Memorial award 1965), North Shore Arts Association (past president, Gordon Grant Mmel. award 1967), Springfield Art League (honorary), Philadelphia Water Color Club, and Academy Political Science. 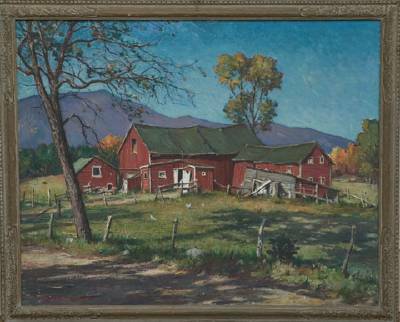 Other awards include the Gold medal, Jordan Marsh, 1959, 65, 1st prize watercolor American Academy Artists, Springfield, Massachusetts, 1959, Gaylord Marine prize oils, 1960, Winsor Newton prize, American Professional League, 1962, Mitton Memorial prize, 1965. He was a member of numerous organizations including the Concord Art Association, Society of America Etchers, Boston Society of Water Color Painters, Allied Artists American, Guild of Boston Artists, Audubon Artists New York, Rockport Art Association (prize oil 1959, Charles H. Cleaves Memorial award 1965), North Shore Arts Association (past president, Gordon Grant Mmel. award 1967), Springfield Art League (honorary), Philadelphia Water Color Club, Academy Political Science and the Salmagundi Club. His paintings can be found in many Museums and Collections including the Boston Museum of Fine Arts, Bowdoin College, Amherst College, Fort Worth Museum of Art, The Brooklyn Museum of Art, The Fogg Museum at Harvard University and a host of other private collections. Since both artists were active in the Philadelphia and Ogunquit areas, there is little doubt that Quirk and Woodward met on at least a few occasions. And the affinity might have been enhanced by their sharing an affinity for the sea and a representational style. One key difference may have been the larger name achieved by Woodward and the long tail that remains in the art world. For example, a quick search has revealed over a hundred images of Woodward paintings in collections or that have changed hands at auction. When we began this project of learning about Quirk, we were able to locate 10-15 images. Below is the announcement in the Brown and White describing the exhibition. We have made the presumption that Woodward may have influenced Quirk as he was about 17 years older. Below we present paintings of similar subjects by both artists for you to decide if there is artistic overlap or influence. It may also be that the two artists were swimming in the same milieu and there are a few types of views that make better paintings. Thus by chance they may have painted the same subjects. We will close this post with two paintings by Stanley Woodward that both show the old barn. He painted it a number of times. May 2018 update. 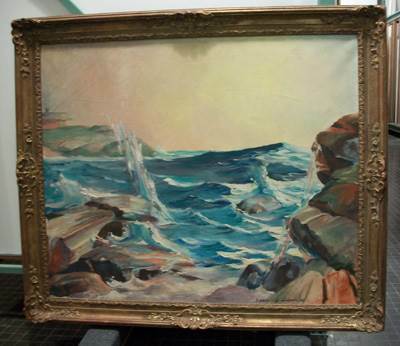 We found the painting below going up for auction at the Sandwich Auction Gallery on Cape Cod. 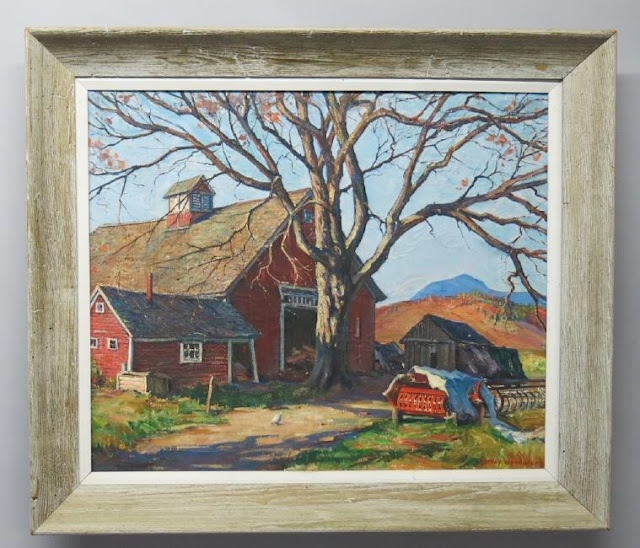 It appears that Woodward loved painting "The Red Barn." Although this one appears different from those above.